Sometimes – usually after I’ve overloaded on too much cake and croissants – my idea of a dream vacation is to go to a nice seaside health resort to lose weight, eat good food, relax and rest without stepping inside a gym, and do hardly anything . Hahahaha! Sounds too good to be true? It’s not. Such places do exist! The hilltop swimming pool at Barberyn Beach Ayurveda Resort in Weligama, Sri Lanka, has a stunning view of the Indian Ocean stretching out in all directions, but even on a gorgeous morning, with the sun-dappled surf crashing on the pristine beach just beyond the fringe of breeze-blown coconut palms, there’s hardly anyone basking in the brilliant sunshine. That’s because morning time is when most of the guests are sequestered inside the resort’s Ayurvedic Healing Center, where they undergo the series of heated oil massages, hot compresses, herbal steams, herbal baths, and acupuncture that make up the detox healing process that is the mission of this lovely beach resort. Barberyn Beach Ayurveda Resort is completely dedicated to healing the mind and body through the strict practice of Ayurveda. Immediately upon arrival, each guest has a consultation with the Ayurvedic doctor, who prescribes an individually tailored program of daily massage treatments, diet, and fresh herbal medicines to detox, de-stress, bring the body back to total wellness as well as balance the mind. The resort’s Ayurvedic Health Centre is located in an airy building housing consultation rooms for the in-house Ayurvedic doctors, treatment rooms, a pharmacy where the herbal medicines are freshly concocted every morning, and a dispensary where guests pick up their daily doses of tonics and powders. What is Ayurveda? This ancient holistic healing system originated in India and dates back more than 5,000 years. Ayurveda can be unfamiliar and mysterious to everyday consumers, partly due to its esoteric philosophy, complex therapies and intricate blend of herbal medical concoctions. Never had an Ayuvedic massage before? Expect oil. Lots and lots and lots of oil. Translated from Sanskrit as the “science of life”, Ayurvedic medicine is based on the theory that our bodies are categorised into three biological humours, or doshas. Illnesses that we suffer are the effects of imbalances in these doshas. The three doshas are the Vata, Pitta, and Kapha. Each individual possesses a unique makeup of these energies. Thus while two people may have the same illness, the sources of their illnesses will differ depending on their different dosha constitutions. The Ayurvedic physician diagnoses and prescribes a different treatment for each person, based on the dosha that is causing the illness. 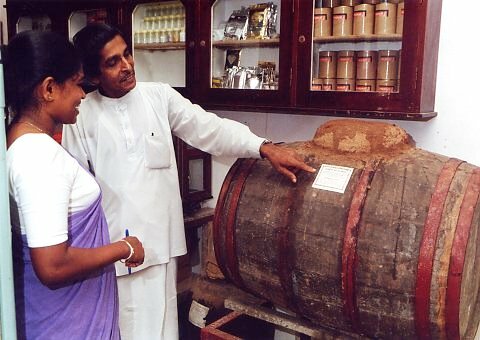 While western medicine prescribes medication to eliminate the symptoms of illness without actually curing the source of the illness, Ayurvedic treatment seeks not just to cure the symptoms, but to balance the physical and mental aspects through a system of herbal therapies, oil massages, diet, yoga and meditation. The key theories and practices of Ayurveda were transported from India to its neighbours – Sri Lanka, Burma and Thailand -in the second and third centuries by missionary monks who migrated overseas to spread the teachings of Buddha. Since monks were also the healing practitioners of those times, they also dispensed medical knowledge. Sri Lanka has been practising this holistic science for centuries and offers serious, professional Ayurvedic healing resorts in a gentle island setting. Some travellers prefer this instead of going to India. During my two-week detox holiday at Barberyn Beach Ayurveda Resort, I came across a wide range of guests, mostly European, who were at the resort for their health and wanted to combine an exotic and relaxing holiday with some sort of wellness goals. Some sought relief for serious medical ailments such as diabetes, eczema, psoriasis, respiratory problems and even recovery from strokes, for which Ayurveda offers real cures. Others were there simply to de-stress and detox in an exotic beach setting. The guests are a mix of ages, groups, couples and singles, though it seemed most popular with solo travellers who were taking time out for themselves. I had a huge split level room with a spacious sitting room down some steps. Because Ayurveda is herbal and takes time, guests are recommended to stay a minimum of two weeks for real changes to take effect. As a result, with guests eating the same food and herbal medicines, doing the same treatments, and yoga and swimming every day, a strong sense of community develops because everyone shares the common goal of wellness. The wellness center lobby where afternoon tea is served every day. I’ve been to the two Barberyn Resorts properties in Weligama and Beruwala a few times and I always met interesting people on each visit. And I’ve made friends who live in other countries who I’ve kept in touch with over the years. I noticed that because Barberyn is not an ordinary beach resort and isn’t a mainstream travel destination, it tends to draw people who are well educated and well-traveled, so even if you come alone you end of with plenty of interesting dinner companions and fellow guests to talk to. The resort seems to be popular with women, many who were there primarily to lose weight, along with achieving general wellness. Marianne, a Swiss guest in her twenties, came to lose weight because she had gained 15 kilos when she quit smoking. She returned home 3 kilos lighter after a one-week stay undergoing daily massages, herbal medicines and a controlled diet of Ayurvedic health food. The average weight loss among Barberyn guests is three to five kilos in one or two weeks. One of the resort’s interesting stories was Lucy, an American writer who had originally stayed at Barberyn on her way home from the Maldives and loved it so much that she changed her life and moved to Sri Lanka. During my stay at Barberyn Beach Resort, she was working as a consultant for the resort gift shop, and was a familiar figure around the resort, with her blonde pixie hairdo and cheerful attitude. I’d actually met Lucy a year earlier on a visit to Barberyn Reef Beruwala, and was amazed at the transformation from the very overweight, self-absorbed, loud, overbearing and rather miserable person I’d met earlier (the original Lucy) to this slimmed down, happy, cheerful person who floated around in gauzy Indian kurta tops and cotton pajama trousers (the new Lucy). It was hard to believe this was the same person. Not only had she lost an astonishing lot of weight, but all the negative, miserable energy had disappeared along with the fat. Her whole energy had shifted, and become lighter. Even her hair looked happier, fluffier and blonder. So of course, I had to find out her story. Like many Barberyn guests, Lucy ended up extending her stay. She had originally come for two weeks and ended up staying for six. She started really losing weight in the third week, when she began getting serious about weight loss and stopped gorging herself at the buffet which she said was too delicious to resist at first. She started exercising by daily swimming and walking around the property which is spread over 15 acres of calorie-burning hillside. ”Getting daily herbal oil massages played a huge role in helping lose weight,” said Lucy, “ because it stimulates the circulation and metabolism, and balances your whole system.” This combined with herbal medicines and controlled diet helped her eventually lose 14 kilos. Lucy said three main factors helped her change – the diet and treatments, the physical aspect with the exercise and the gorgeous environment, and a new way of thinking that she learned from Buddhist monks. The combination of Ayurveda and Buddhist thought helped Lucy make the mind-body connection. Barberyn Ayurvedic Beach Resort in Welligama is the second property in the Barberyn Ayurvedic Resorts group. The original property, Barbaryn Reef Ayurveda Resort, located in Beruwala further up the coast 80km from Colombo, was founded over 40 years ago by Sudana Roderigo when healing resorts were virtually unheard of. “Four decades ago, there were hardly any hotels on the island’s southwestern coast, and the concept of destination spas didn’t even exist. Back then, the idea of a healing resort was simply unheard of,” recalls his daughter Geetha Karandawala, a retired lawyer who co-owns and runs the resorts with her siblings. Over the years, Barberyn built a strong reputation and a loyal following of return guests purely through word of mouth. Recognised as the pioneer of Ayurvedic healing resorts, Barberyn is also known as the most authentic Ayurvedic resorts in Sri Lanka, in a league of its own compared to newer and gimmicky “Ayurvedic spas”, offering no more than a few herbal oil massages. Authentic Ayurvedic healing takes more than a few oil massages. It’s the total integration of individual diagnosis, daily traditional treatments by trained professionals, the correct diet, and the proper herbal medications, that provide a holistic lifestyle that’s best experienced in a dedicated environment. When this environment is a spectacular beach setting, it only helps speed the total healing process. Have you been to an Ayurvedic resort? How was your experience?